Lottie Withers Sullivan testified during Kate Wiley Allen’s pension hearing that she introduced Thomas Allen and Kate Wiley. When I first read Lottie Sullivan’s testimony, I wondered how she knew Thomas Allen and Kate Wiley well enough to introduce them when she was ten years younger than they were and so a child when they met in 1879. As I went through various census records, I realized that she played rather lose with her age. She was actually about the same age as Kate was when she introduced them, twenty years old. Lottie was born in Kentucky about 1959. In 1870 she was eleven years old and lived in Indianapolis with her mother Jane and her step-father Levin Ballard, a carpenter. There were also numerous other children in the house, siblings and two baby nieces. The school age children, including Lottie, were attending school. An older sister did laundry and an older brother was a laborer. The oldest household member were illiterate. Levin Ballard died in 1879. 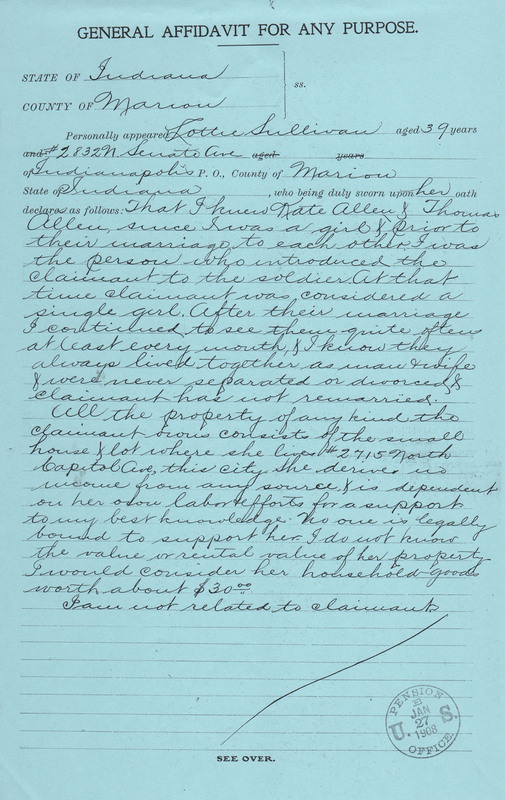 In the 1880 census, Lottie’s mother, Jane Ballard, and her oldest sister, Caroline Thornton, worked as domestics. Her older brother was now a teamster. These three were unable to read or write. Twenty one year old Lottie took in washing and was literate. Caroline’s eleven year old daughter Anna, attended school. They had one border, a twenty six year old house painter. On February 9, 1881 Lottie married Henry Sullivan. In the 1900 census Henry and Lottie owned their home, which was mortgaged. Henry worked as a coachman. Lottie took in laundry. Her 81 year old widowed mother lived with them and did have an occupation. The mother had borne seven children and only one was living. Lottie had no children. They had a 14 year old border. Everybody in the household could read and write, except Henry who could not write. 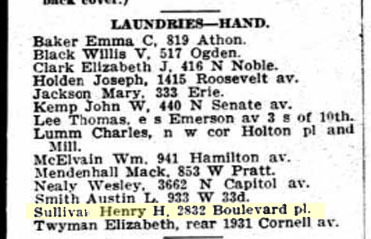 Henry and Lottie went into the laundry business and were listed in the City Directory in 1917. In the 1910 census they both are listed as working on their own account, doing laundry. Lottie gave her age as 38. She also said she had been married for 30 years. They have two borders, one a 26 year old divorcee born in New York and a nine year old boy. Lottie’s husband Henry died on February 26, 1917, just a few weeks past their 36th wedding anniversary. He had been under a doctor’s care for about a month when he died of chronic inflammation of the kidney (parenchymatous nephritis). A contributory factor was aortic insufficiency. He was embalmed and buried in Crown Hill Cemetery. I could not find Lottie in the 1920 census, by 1930 she was listed as a border in her own house. She was seventy one, although the census says sixty seven. She was not working so I am hoping she sold her house at a good price to Atty. Forrest W. Littlejohn, who seems to own the house. The house is worth $6,000. Three years later Lottie Withers Sullivan died of acute appendicitis at age seventy four at 3:30AM January 18, 1933. She was buried in Crown Hill Cemetery. Amazing he documents you have uncovered. They were all on ancestry.com, familysearch or Thomas Ray Allen’s pension file. Lottie is a name I first heard as a boy. A lady in our village with that name had been a missionary in India in the 1920s. She must have been younger than your Lottie who is another to feature in Thomas Allen’s story. 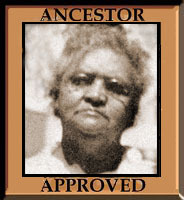 In one census, Lottie’s name was given as Charlotte. I wonder if your Lottie’s name was Charlotte. I have never known anyone by that name but I remember there was a “Little Lottie” comic book when I was a kid. Censuses are marvellous for the details they give and of course who is in the household. Inaccuracies about age do make it tricky but congratulations in tracking her down. I wonder how she first met Kate. Church or school? Not school as Kate was past school age when she arrived in Indianapolis. Maybe church or maybe they worked together or lived close to each other. 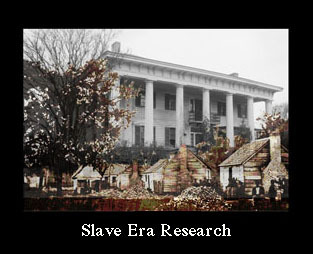 I should see if I can find their locations around 1880. And where did she meet Thomas so she could introduce him to Kate. Did Thomas and her brother work together? I couldn’t find Lottie’s marriage certificate, just an index entry there was no name of a minister. It would be interesting to see if Rev. J.R. Raynor married both couples. I bet it was common for people to “play loose with their age.” My mother in law, she has a birth certificate that we think she altered by 5 years, changing the 8 into a 3. People may not have wanted others to know their real age, for whatever reasons. It was common. Especially among women. Some got younger with each census. I found a great aunt who had taken 20 years off of her age. Wow, very thorough genealogy search. Last year, I had a taken it upon myself to find out about my father who I hadn’t known for more than 33 years. I have come to find many things about him sense. Some things not so pleasant. But I found out I have a half brother and hope to find him one day. Maybe this post will inspire me to search. Good luck! I hope you are able to find him. What Lottie her birth name? or her a shortening of her formal name? 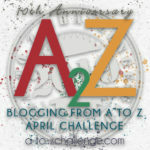 Sandra, Aspiring family historian, fellow participant in the #AtoZchallenge Dropping by from the AtoZchallenge. In one census record her name was given as Charlotte, so I think Lottie was a shortening. It was the same with Kate, her name was given once as Katherine, but all other times she was referred to as Kate. That’s an interesting point. Since so much of your data is based on written accounts, how do you know if/when people are being honest? The same is true for spoken accounts, memories etc. Plus, there are so many gaps, sometimes decades missing. You have to compare answers and hope to come up with something approximating the truth. With age, I take the age on the first census record in which they appear or baptismal record as being closest to the truth.